]The General Minister and President of the UCC, John Dorhauer, visited Back Bay Mission in Biloxi MS for a few days late in September where he engaged staff in conversation about their passions for service, observed programs in place, and met guests and clients. Coinciding with that visit was the Back Bay Mission Board of Directors meeting, led by president Matt Williams. At the board meeting Dr. Dorhauer overviewed some challenges of the times and then asked the board to reflect, discuss and share what is working at BBM, what is not working, what is working but making no difference and what do we need to look like in 10 years. 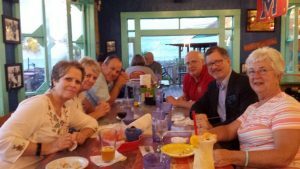 During meal times, staff and board members provided fellowship opportunities, gulf coast hospitality and tasty shared meals. The photos were taken the evening before meetings began. 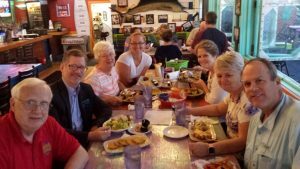 It is at Shaggy’s (a Biloxi restaurant that supports Back Bay Mission) and those present were UCC General Minister and President John Dorhauer, Board members Crystal Allen (OH), Mary Ruth (TN), Matt Crebbin (CT), Staff members Carol Merriman (WI), Paul Longstreth (TX), and Volunteer Kelly Divine (OH).